Great news! The Sausage Shack is now open for business. Owner Dan Eastwood told us yesterday that they would have a soft opening from Thursday December 21st. Dan relocated the acclaimed Sausage Shack from the Altamonte Mall to Hannibal Square, in order to reach a wider audience after “The Shack” quickly made its mark as a fantastic local food concept. Dan is always on the lookout for new products and sausage combinations to wow The Sausage Shack’s growing number of faithful followers. The concept is simple. 1. Pick your sausage type. 2. Select your bread then. 3. Pick your toppings. Or alternatively choose one of their specials and side dishes. Don’t forget to try the fantastic Mustard Bar. Today we just had to try the Donut Dog – Smoked Polish sausage on a hot dog roll, glazed with butter and hand tossed in sugar, topped with sweet relish, sweet hot mustard and cheesy sauce. Different and Oh! so good. 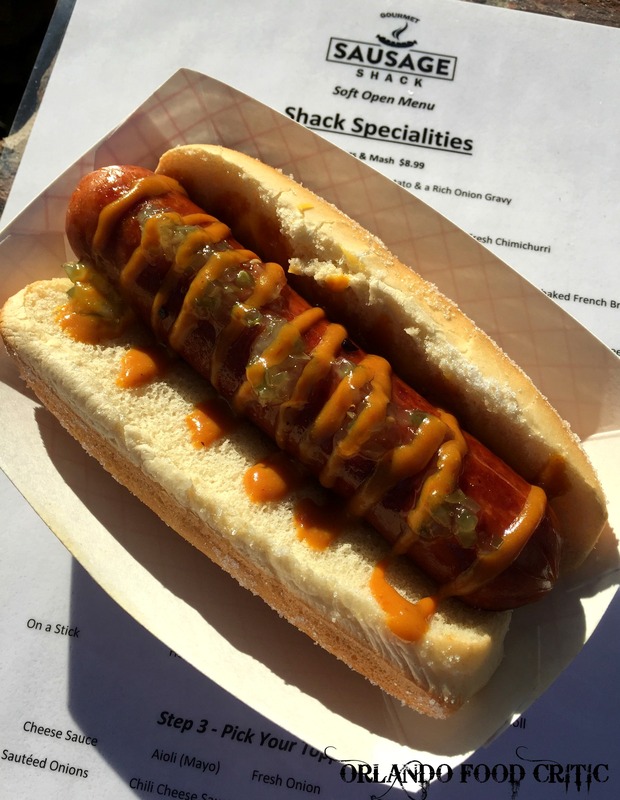 You will find The Sausage Shack at 400 West New England Avenue, Hannibal Square, Winter Park, just a short stroll from Park Avenue, in the spot previously occupied by The Park Café Bakery.